We all know that making New Year’s resolutions is a useful way of getting things done and achieving particular goals; however, setting them is easier than actually doing them. Typically by March what we resolve to achieve fades away like a dream as we get distracted by our daily routines. But in the last several years, I have found that if I make a list of ten or more personal goals, I will achieve at least a few of them. The key to accomplishing my goals is making them practical and measurable. But most importantly, your goals need to have a start and end date, and you must be reminded of your progress. Three websites, LifeStick.com, Solidgoals.net [No Longer Available], and 43Things.com might be helpful in this regard. But before we turn to these, a simple calendar and e-mail reminder may suffice. If you’re not keen on joining yet another website, you can simply use Google Calendar or some similar application for setting up reminders about the goals you set. Simply resolving that you’re going to lose 10 pounds in three months is not enough. You need to make a plan to accomplish that goal, and you want to make progress toward that goal on a daily or weekly basis. SolidGoals.com is an easy to use and free website for creating goals, setting tasks and milestones, and reminders. After registering on the site, you can immediately start setting up goals and setting deadlines. SolidGoals.com also includes social network integration (including Facebook) in which you can follow other goal setters and provide comments about what they seek to accomplish. The key to using this site however is to set up a preparation list, milestones and e-mail reminders, especially for goals that are not integrated into your daily routine. LifeTick.com has more professional features set up for individuals and professionals who coach others in related goal setting activities. While the free version only allows you to set up four goals with e-mail, smartphone, and iCalendar support, the service could still be very useful for more challenging and long-range personal goals. LifeTick.com starts off by asking you to define your core values, such as lifelong learning, family, creativity, work, and relaxation. When you set up a goal you connect them to one of your core values which gives it more meaning. A useful feature in setting goals on LifeTick it reminds you that your goal should be S.M.A.R.T.—Specific, Measurable, Achievable, Relevant, and Time Specific. You can also set up individual tasks to accomplish toward your goal, and receive designated e-mail reminders for your deadlines. LifeTick also has an iPhone and Android web-based app (found here —not from the App Store) which can be useful for managing and keeping current on your goals. We have written about 43Things.com before but it is worth mentioning again as the site is useful for brainstorming a healthy list of resolutions – both small and large – and accomplishing them as you see fit. Based on my own experience, it is quite easy to set up goals on 43Things.com and then forget about it. So again the key to using this site is to set up regular e-mail reminders for designated goals, or even use an Automator hack, or similar automation program that opens the website for you on a regular basis so you can review the goals you set. The beauty of using 43Things is looking back over your list of accomplishments and writing reflections about how you did or did not achieve a particular goal. Dedicated users of the service can help one another stick to their resolutions. Members of 43Things are already setting New Year’s resolutions for 2012. Some of the top goals include losing weight, reading books, getting more sleep, and taking charge of personal finances. 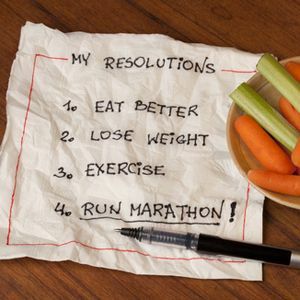 What are your New Year resolutions so far? Do you have a website or other resource you use to keep track of your resolutions? Let us know about it. For other ideas on goal setting, check out 100 Things to Do Before I Die: 6 Sites To Create Your Own List 100 Things to Do Before I Die: 6 Sites To Create Your Own List 100 Things to Do Before I Die: 6 Sites To Create Your Own List Read More .